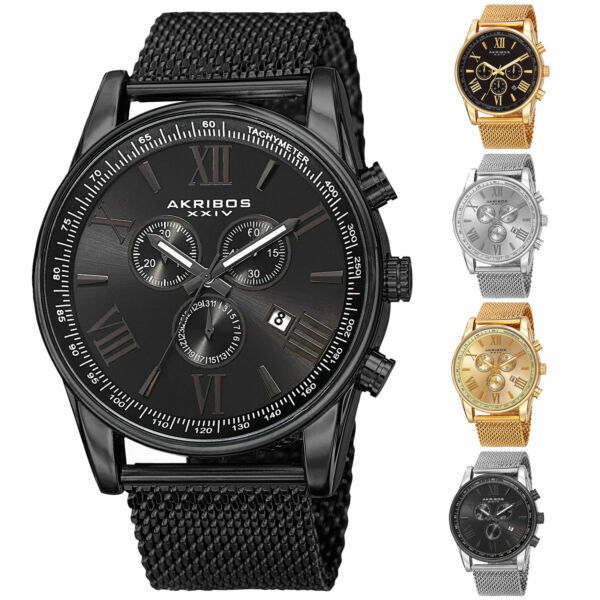 eBay From the Akribos XXIV brand, the AK813 chronograph watch presents a classy and elegant look for any occasion. Displaying its three-register dial and yet offering a clean look, this item features a modern-day sized case (45millimeter) mounted on the signature fine steel mesh bracelet! The real star however, is the engine that powers it. ..the Swiss ISA 8171 quartz chronograph movement! A world class chronograph movement, the 8171 provides 'add and split' functionality for taking 'split timing,' and a 30-minute counter. The premium Swiss ISA movement has its famous ultra-high pulse rate of five beats per second! Just hit the reset pusher at the 4:00 position and watch the smoothness in which the large 'stop-center second hand' sweeps to reset! The 8171 also provides a double calendar function. ..with a numeric date-wheel exposed at the 4:00 position to provide the date AND a 'month-at-a-glance' sub-dial at the 6:00 position to know where you stand in the current month at a quick and easy view! The make and craftsmanship of the AK813 does not take a back seat to its design: The metal case is finished with a high mirror polish and the bracelet is formed from solid stainless steel. The dial is hydraulically struck and embossed to present dimension creating a radiant 'sun ray' visual on the main dial with a concentric circle design in the sub-dials! The hour markers are all individually hand applied to the main dial with large Roman numerals at 12, 2, 4, 6, 8, and 10 o’clock with baton-style indices at all the remaining positions. The hour and minute hands are filled with Super Luminova for easy reading in the dark. The outer circumference of the main dial hosts an 'easy-read' angled flange with a printed Tachymeter for measuring speed of an automobile. The sapphire-coated mineral crystal is slightly domed adding pleasing shape and allows for the best attributes of both sapphire and mineral. The stainless steel case-back assures the water resistance to 10 meters. The entire look is finished appropriately with its fine stainless steel mesh bracelet and accompanying easily adjustable sliding buckle. The steel mesh allows for a smooth comfort on the wrist with the 'liquidity' necessary to 'wrap' the wrist. Further, with the easily adjustable sliding buckle the AK813 is a perfect fit on every wrist! All Akribos XXIV timepieces come packaged in a beautiful, plush keepsake box and carry a two-year warranty. The Akribos XXIV AK813, a gentlemen’s fine timepiece carries a look of luxury, but does so subtly. ..as if not trying too hard. ..delivering a causal elegance that is perfect in any setting!